The goal of the MInMED (Models and Methods of Innovation Management in Complex Engineering Systems Development) research project is to develop a set of fundamental models and methods for innovation management within and across hierarchical social networks exiting in contemporary private and public R&D organisations, and to explore and develop analyse and simulation tools for quantifying knowledge and information dynamics as a mean for prediction of the future trends in organisational innovation. The context of the socio-technological framework that transcends the organisational innovation dynamics within contemporary engineering systems and services life-cycle requires the research overriding commitment to methodological pluralism. The integrated analyse – evaluate - create – refine - validate approach will be used as research methodology. The research will build on state of the art developments in the exploration of principles of knowledge management for R&D organisations and will go further; in that it will seek to incorporate the insights from modelling, simulation and visualisation of the complex social, natural and technical systems to the knowledge and information dynamics that encompass the generation, storage, dissemination, filtering, and reprocessing of innovation across hierarchical socio-technological networks. 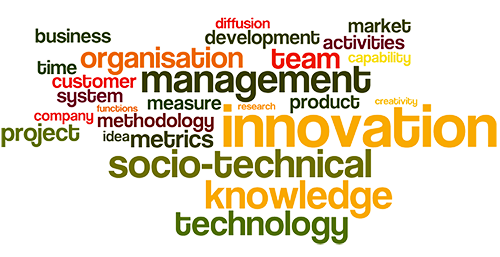 The research effort will entail the development of concepts, theories, metrics and case studies related to the R&D organisational innovation management. The controlled experiments in real-world private and public R&D organisations will be used in research to gain valuable insights across different sectors (automotive, aerospace, energy, transportation, healthcare, public administration, etc.). It is expected that the results of the proposed research will provide valuable interdisciplinary contributions and improve overall understanding respective to the organisational innovation. Developed by AMagdic Web Design. Copyright © 2015 MInMED.org. All rights reserved.